Congress General Secretary Digvijay Singh has rightly said that though in its one year of governance the Modi government’s performance may be zero but Modi continues to glory his regime performance boastfully as Modi is a good marketing guru who has perfected the art of selling products with zero performance. A picture of this can be seen gauged by his popularity among the UN, which has passed Modi’s proposal of International Yoga Day within 100 days through whopping support of 177 nations. In his speech an elated Narendra Modi, patting his own back said, “It's a matter of honour for our nation; did anyone think that yoga can also be used as a toll to connect different nations?" To make the International Yoga Day a historic event Modi is thus exploiting all the tricks of his Marketing Mantra. 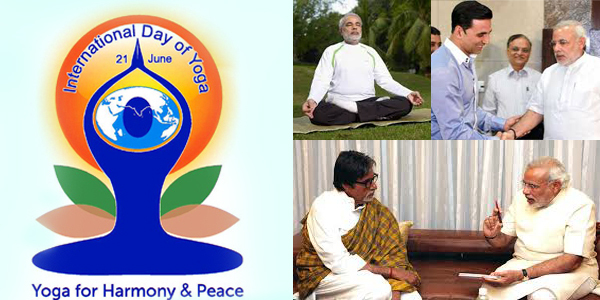 To begin Modi has roped in all the top notch Bollywood actors like star of millennium Amitabh Bachchan, Akshay Kumar and Shilpa Shetty along with cricketer sensation Virat Kohli and wrestler celebrity Sushil Kumar as brand ambassadors for Yoga Day on June 21. To guarantee utmost publicity and garner maximum crowd participate in the event, the Modi government's Information and Broadcasting Ministry has ordered all broadcasters to telecast the videos featuring above celebrities promoting the event to be telecasted at least four times a day. Readers would be surprised to know that to give boost to Yoga and Ayurveda, PM Narendra Modi has formed the First of its kind Ministry called AYUSH (Ayurveda, Yoga and Naturopathy, Unani, Siddha and Homoeopathy). The Ministry is headed by Union Minister Sripad Naik and it is under his Ministry the entire program will be held. To give an International appeal to the event AYUSH Ministry is contemplating on registering the mega event into the Guinness Book of World Records. A senior official from the Ministry informed, “The Ministry is attempting for Guinness Book of World Records. The conditions are very strenuous. Their (Guinness) parameters are very strict. Therefore we are working out on that aspect. Most probably we will do it,"
To garner such a huge crowd the AYUSH Ministry has hired 10,000 defence and paramilitary personnel, about 15,000 people will be drawn from yoga institutes like that of Baba Ramdev and the rest will come from all government offices, schools, colleges and other attracted by the marketing blitz of celebrities on TV and social media!!! Truly Mr. Prime Minster, you deserve to be called Marketing Guru!